There is an almost endless list of Islands to visit in the area, some with a short ferry ride some a bit longer. Ferry services are fantastic and run to a Summer and Winter timetable. I've listed below some of the small Island to visit with links to their local websites if they have one. You can choose on the longer ferry routes not to get off at your destination and just go for a trip and meal. The food on Calmac Ferries is excellent. Mull is a beautiful large island to visit with lots of attractions, have a look at there website for more details - Isle of Mull. 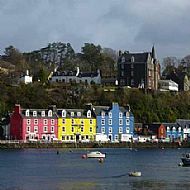 It is of course the home of Balamory made famous from the kids programme. From Mull you can visit Isle of Iona and the abbey there. It is a large island so if you are going to visit, make sure you book your car onto the ferry. The ferry in the summer is really busy so don't just turn up and hope - book! There is usually room for foot passengers all of the time and there are buses at the other end. Again I would book in advance at the Calmac Ferry Terminal to get a better price and ensure a place on the bus. This is especially true when the Music Festival or Car Rally are on. You can see Kerrara as you come down the hill into Oban. Kerrera only has residents cars on it, so both ferries are for foot passengers only. One ferry is run by Oban Marina which leaves from the North Pier and one run by Calmac which leaves from Gallanach. There is a great circular walk that you can do on the south end of the island (get the Gallanach Ferry). There is a tea room near Gylen Castle at the south end of the island (mention you are staying at Bays and Bens Holidays and you will get a 10% discount) and there is a restaurant in the Marina. Both run seasonally so have a look at their websites before you go. Easdale is one of the nicer small islands to visit. You have to cross over the only bridge over the Atlantic onto to Seil Island and then take the small foot passenger ferry to get to it. The Island itself has a great playpark, pub/restaurant and a museum. The island itself used to be a slate quarry there are footpaths along the coast, around the old flooded quaries and upto the top of the Island. There are no cars at all on the island, the islanders use barrows and the odd quad bike to transport goods from the ferry. In September each year the island holds the World Stone Skimming Championships, this is well worth a visit to either watch or to compete in. I have won a couple of medals myself! Seil is a small island to the south of Oban. You have to cross over the only bridge over the Atlantic to get to it. The bridge itself is very picturesque and there is a good dog friendly pub just on the other side of it. 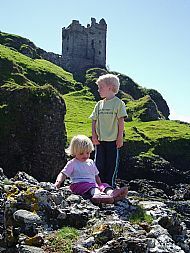 From Seil you can get a foot ferry to Easdale Island from Ellenabeich and the ferry to Luing from Cuan Ferry. Ellanabeich is well worth a visit as well, with a gift shop and pub. Luing is one of the larger Atlantic Islands and has a car ferry across to it. There is also bike hire available on the island. There is a restaurant/tea room which is open seasonally as well. Lismore is a long island that can be accessed by two ferries, one from Oban (takes cars and passengers) and one from Port Appin which is passenger only. There is a Museum as well as bike hire. Iona and its Abbey are a great place to visit for a day out, it has golden beaches (search them for bits of agate). You get to Iona from Mull on another Calmac Ferry, so visit the ferry terminal or website to book. The Isle of Iona website is excellent so have a look at it for information.